Let me first wish you a HNY, now that we are in 2016! Today I like to share with you a photo I absolutely love… why? It shows a Hispano-Suiza, an Amilcar and a fierce racer which could perhaps be a Mors? This year I will definitely be on the road in a number of rallies with Amillion (my Amilcar CGS), but there is one more thing I wish for this year. I hope my dad will accompany me in his, hopefully finally completed, Hispano ‘Grand Sport’, so that we can both have fun in our prewar beasts, one of which is a small beast ; ) Hispano Senior and Amilcar Junior, or as Simon, one of CHB’s writers told me, Hispano the elder and Amilcar the younger. These terms are used in the art world and as I call vintage and classic cars art as well, the elder and the younger it is! Or as we say in Dutch, like father, like daughter (although it would usually be son instead of daughter, obviously…). Also a good moment to show my appreciation for my parents for giving me this most incredible name Atalante, and for my dad for passing on this great automotive passion, which is FORMIDABLE! To come back to a question raised by Simon, my dad started at young age with mopeds, Puchs and the like, and restored them a bit, just like most of you have done? We all have dreams and some come true and so had my dad. His passion for the fine automobiles already started at a young age. The family Mercedeses definitely had an influence on his interest, but soon a list with dream cars was developed. Number one went to Bugatti, not surprisingly, but next to the ultimate type 35 GP there was more. You can guess the second one, Hispano-Suiza, followed by many more, like Lagonda, Delahaye, Alfa Romeo, Talbot-Lago and so on. It just so happened that my dad got involved with Hispano-Suiza, and with Delahaye as well. While he owned examples of each, and still does, he put a lot of effort in these marques. He now is a kind of walking encyclopedia and I wish that one day I will know as much as he does, or at least have gained part of his knowledge. My dad’s first car on that list was a Delahaye, quickly followed by the Hispano, which he purchased from down under. I can’t wait to see our Aussie Hisso run on the Dutch asphalt! Let’s hope that I can soon post a photo, capturing my dad in the Hispano and myself in the Amilcar, similar in the adjoining period photograph. To come back to this photo and the cars shown, we see an Amilcar C6, a Hispano H6B and a wonderful rare racer which could be a Mors, judging by the design of the top of the radiator. But I have found no reference to any Mors racers from that era, only from before WW1. The Amilcar C6 is a production model, derived from the 1925 6-cylinder CO racers. The C6 was a limited production sports car for the wealthy sporting Amilcar clientele. It was three times as expensive as Amilcar’s entry model, the CC. Only a small number of the C6 were built and today about 25 of them are known to still exist. The C6 was a worthy rival in races and hillclimbs, against Bugattis, Salmsons, BNCs, etc. 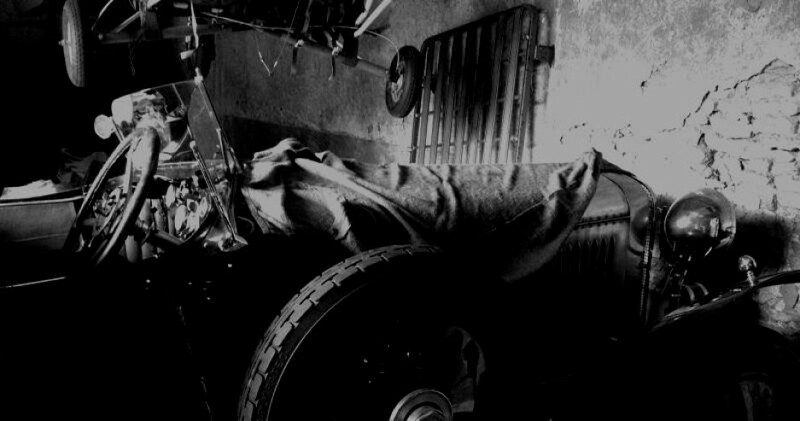 The fierce voiturette was, and still is, a great piece of historic automotive technology. This miniature Grand Prix car had a price tag of 60,000 Francs, making it quite an expensive ‘poor man’s Bugatti’, but it could successfully compete against the blown Bugattis type 35 and 37. The advantages of the C6? Due to its short wheelbase, small chassis and lightweight engine and drivetrain, the C6 is exceptionally light. This gives the 6-cylinder 1100cc engine the chance of being turbo fast for its era. This was proven time after time it seems… After the model’s debut at the 1926 Paris Salon, the first C6 was completed for a Montlhéry test where it claimed an initial top speed of 165 kph. The high revving engine is a fully modern DOHC design with a Roots-type supercharger and dry sump lubrication. It has a 7-main bearing crankshaft which can withstand engine speeds of 6500-7000 rpm! – in 1925! The Hispano is a model H6B and sadly cannot be identified by the marque experts. Could it still exist or be hiding somewhere? Its number plate is a Paris plate from before September 30, 1928, and unfortunately all the Paris files from that period have been destroyed, so we may never know which chassis number this beauty had.